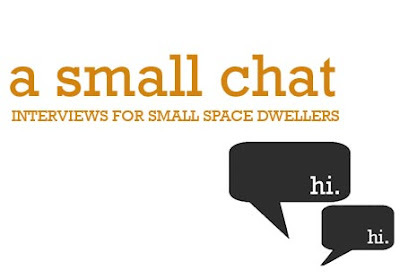 This week's A SMALL CHAT is with the lovely Laure Joliet, fellow Apartment Therapy writer, Dwell contributor, blogger for her own design blog, At Home At Home and photographer and owner of Laure Joliet Photography. To say Laure has an amazing eye is an understatement. Her design style is vintage meets elegant simplicity and you can tell she really cares about her home and enjoys living in it. Enjoy this little interview with Laure and her small space style. And click here to see Laure's incredible portfolio and to contact her for any photo projects. You have shared your Venice home on Apartment Therapy and it's full of family heirlooms, vintage style and modern touches. Your space really feels big even though the footprint is small. What small space ideas went into designing a layout that was comfortable, functional and stylish? I like to block out spaces so that each area is defined. For the studio there were three areas downstairs: dining room/office anchored with the dining table and the credenza, living room anchored with the danish love seat and chair and the kitchen which is separated by the standing kitchen island. It's important to zone your space otherwise you end up pushing furniture against walls and cramming too much in. I also edited my belongings by going through everything and donating books, clothes and just stuff. I knew I would love having space more than having stuff. This way I could keep everything in the 2 credenzas and the overhead storage and it didn't have to be out and in the way cluttering up visual space. It's also important to consider your color palette: if you keep a palette going throughout a space then it feels larger because the eye sees the space as a whole. I love having plenty of empty white space on walls with pops of blue, green and orange around. As a writer for AT and Dwell and your own blog, At Home At Home, you've covered some pretty amazing small homes and design ideas. What are your best tips for small space dwelling? And what mistakes do you see being made? I'll tackle the mistakes first. Honestly I think the biggest issue is that people have furniture that's the wrong scale. Don't get me wrong, you can have a large sofa or dining table, but it needs to be balanced with space. You need 3 feet for a comfortable walkway or a space between a table and a wall. So have a nice big dining table but then don't cram in the credenza. And the second one is: don't be afraid of color. A lot of times a small space looks larger once you add texture and pattern to it. It gives your eyes something to look at, instead of how small the room is. Paint a wall a bright color, line one with bookshelves, overlap some rugs or cluster artwork on a wall. When you have a focal point or accent it anchors the space and the the small stuff looks organized and not like clutter. So don't be afraid to have stuff in a small space, just make sure it's balanced with some blank space too. You've been doing interior design and really have created some pretty and functional spaces. What tips have you learned from designing and staging interiors that translates well to designing a home? I've resisted this for a long time but it really, truly helps to start with a floor plan and then a mood board. Putting the time in upfront to determine what you have room for and what overall direction you want to go in saves so much time later. It's tempting to just jump in and start buying accessories, lamps, pillows and start pushing furniture around (and trust me I still do) but you'll be happier with the result if you have a gameplan to follow and help keep you focused. I've also noticed that when we do staging the rooms really come together with the accessories. With the big blocks of furniture the rooms might look empty and boring and a little sad. But adding a cluster of vases, some art, plants, mementos, rugs and throw pillows (keeping a palette in mind and also mixing up textures: wood, glass, paint, linen, pattern, etc) actually brings life into the space. And finally lighting. Having lots of lamps in a space makes it feel warm and inviting. At home I shoot for at least 3 points of light in a room, but when we stage it's more than that. We pair them on credenzas, add them to consoles and have them on either side of every bed. In a studio we just completed, there were 6 lamps. It helped define areas and kept it feeling light and warm. You have great taste and really have mixed vintage gems into your home decor. What are your best tips for scouting flea markets to discover great vintage finds for small space? The Rose Bowl can be daunting, but not if you go often. You start to notice what stuff you're drawn to and then later on when you're looking at magazine spreads you'll notice similar items used in different ways. It gets your imagination working and thinking about objects and furniture differently. Never be afraid to combine different eras. A shabby chic chest with a danish modern table with a lucite lamp can work, just make sure you're buying things that you love or that make you smile. I have a salvation army near me that I check out pretty often. Things are cheap so I feel freer to take risks on things I wouldn't normally consider. I comb through artwork, accessories and furniture and I consider what I can paint, what would look good as a multiple (like a bunch of blue glass jars that might look like clutter if there's just one or two, but 5 of them looks like it's on purpose) and I almost always find a good lamp (I have way too many lamps). Is there a place we can see any of the photos of her small home? Is there a place we can see any of the photos of her small home together? I stopped by from At Home At Home. Hello. Because I also work as a professional home stager I really appreciate Laure's tips. I totally agree that having a plan knowing exactly what the particular room should serve for is very important and saves much time! I am so happy I found this blog. I live in about 1000 square feet and rent so sometime I am designing around a fixed feature . But recently got to paint my fireplace all white yea!